There are many sports facilities that provide athletes with the option of playing tennis in either indoor or outdoor environments. 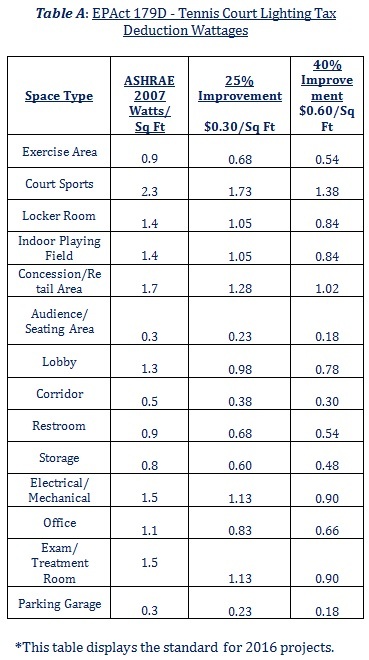 Indoor tennis courts are excellent candidates for buildings that can receive EPAct tax deductions. Tennis bubbles and domes are structures that provide an enclosed environment for tennis courts, making them eligible to receive EPAct deductions. Indoor tennis courts provide an alternative environment for athletes to play tennis when it rains or when the weather is extremely cold or hot. It is difficult for athletes to play in these harsh weather conditions. Consequently, playing tennis indoors is a viable alternative. When designing an indoor court, there are significant characteristics of the building that must be considered. For example, the right amount of lighting is needed for players. Lighting can’t be too dim or too bright because then players may not be able to play as well during matches. Additionally, efficient HVAC systems should be installed to provide athletes with a comfortable indoor temperature. 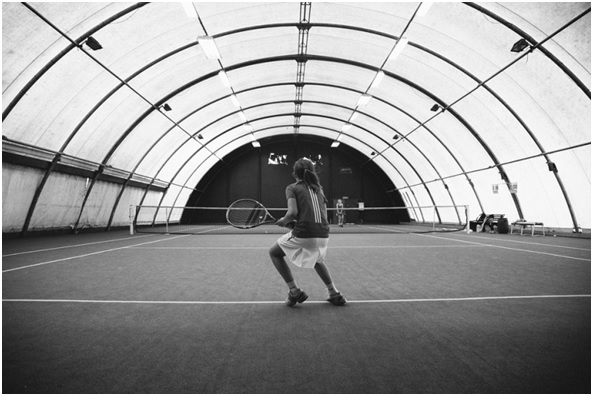 Tennis bubbles and domes have become increasingly popular as indoor sporting facilities. Additionally, they offer many advantages for building owners as well as athletes. Some benefits consist of cost savings and the option of having seasonal enclosures. These structures are especially beneficial for locations where the weather is constantly changing because the bubble can be taken down during warmer months and put up during cold weather. Tennis domes are usually a white or translucent color, which allows the maximum amount of lighting in during the day. 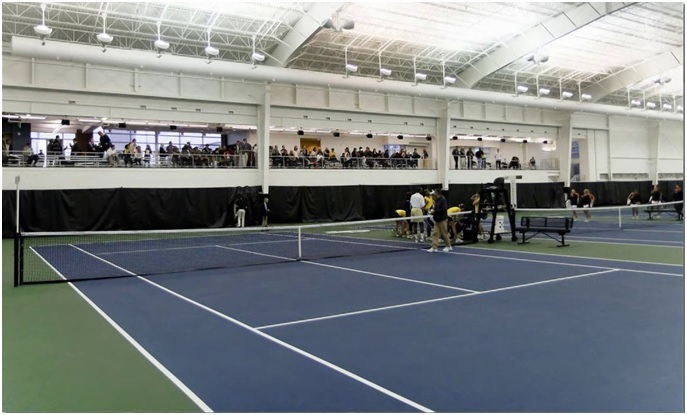 Just like regular indoor tennis courts, efficient lighting and HVAC systems have to be installed to provide players with a suitable environment. exterior perimeter that touches the outside world including roof, walls, insulation, doors, windows and foundation. It is important that both the correct amount and type of lighting are installed in sports facilities. These particular types of buildings should aim to implement energy efficient lighting, such as LEDs. Certain aspects of lighting are required to create the most optimal environment for tennis matches. Lights should be uniform to ensure that every part of the court has the proper amount of lighting. Lighting systems may differ depending on the intended level of playing. For professional tennis matches, a higher level of lighting is required compared to tennis clubs and recreational areas. Indoor tennis facilities usually choose to install indirect lighting, which is when fixtures are positioned towards a reflective ceiling. Implementing an indirect lighting system ensures that no glares occur on the courts. If an individual is exposed to a glare on the court while playing a game, it could easily ruin a player’s performance. This type of lighting system is mainly used in sports facilities because it also provides lights with better protection in the case of getting hit by a tennis ball during a match. The Fort Collins Country Club recently chose to construct indoor tennis courts where Side By Side (SxS) LED lighting was installed as an indirect lighting system. The average light level that this system provides is over 100 foot-candles. The new additions of these LEDs will provide the building with a reliable lighting system and approximately 50% in energy cost savings. Many owners are choosing to implement LED lights within their facility due to these potential benefits. Heated-only tennis courts often qualify for the full $1.80 per square foot tax incentive when LED lighting is installed. In warmer climate areas, HVAC systems are an important part of indoor courts and domes because temperatures need to be controlled for an active environment. It is especially important for buildings to provide a system that is able to provide efficient heating and cooling. Another significant factor for achieving the correct temperature in tennis court facilities is to maintain the tennis court itself. There are different types of materials courts are made of, such as hard clay and grass, that require specific temperatures in the environment. For example, if a facility contains clay courts then a certain temperature and humidity has to be kept in order to prevent the court from drying up. American Sports Builders Association (ASBA) published a document regarding the construction of tennis courts. During installation, equipment should be carefully positioned so that there is no blockage to lighting. The ASBA recommends that owners should implement an HVAC system capable of changing the air from one to four times within an hour. Circulation of air is important due to the high amount of activity that occurs in the building. The system should also be quiet, so athletes aren’t distracted by any noises when they play. It is important to keep a stable and comfortable indoor temperature for individuals. During winter months, the indoor temperature should be around 55- 62 degrees Fahrenheit. During the summer, the system should cool down the building by establishing a temperature that is 10-15 degrees Fahrenheit cooler than the outside temperature. Having energy efficient HVAC systems offer many advantages to building owners. Owners can benefit by including the elements discussed above into their HVAC system. Indoor tennis courts are used by a wide range of individuals. Implementing energy efficient lighting and HVAC provides many advantages for buildings by providing reliable systems and energy saving costs. By installing energy efficient lighting and HVAC systems, sports facilities that contain indoor tennis courts and tennis bubbles or domes can qualify for EPAct energy incentives. Lauren Chin is a Tax Analyst with Energy Tax Savers, Inc.